Heat oven to 400°F. Lightly spray 15x10x1-inch pan with cooking spray. Unroll dough in pan. Starting at center, press out dough to edges of pan. Bake 10 to 12 minutes or until edges are just golden brown. Meanwhile, in 10-inch nonstick skillet, heat oil over medium-high heat. Add shrimp, lime juice, pepper flakes, salt and pepper. Cook about 2 minutes, stirring frequently, until shrimp are pink. Remove shrimp from pan with slotted spoon; set aside. 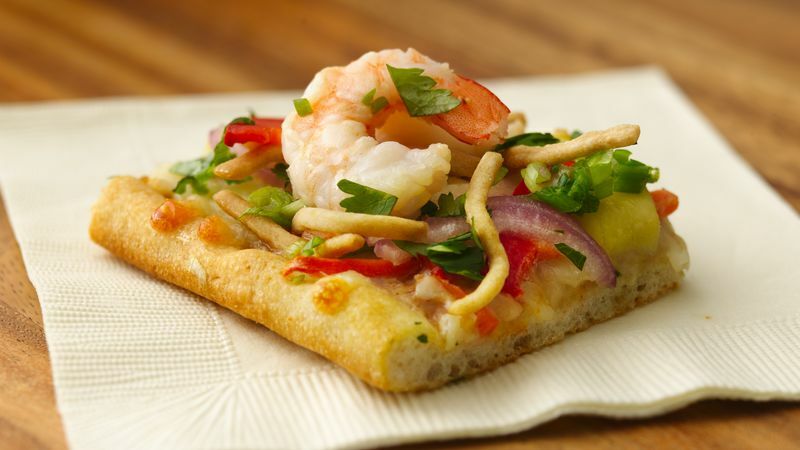 Spread partially baked crust evenly with peanut sauce. Top with cheese, carrots, bell pepper, red onion, mango and shrimp. Bake 6 minutes longer. Sprinkle with chow mein noodles. Bake 3 to 5 minutes longer or until crust is golden brown. Sprinkle with green onions and cilantro. Cut into 24 squares. Serve warm.